What do you get when you put two College National Poetry Slam champions and a haberdasher in a room with microphones and a college audience? You get The Good News Poetry Tour, who came to BU on Friday, February 15 as the feature poets for a Speak For Yourself open mic poetry night. (The haberdasher is also a successful poet, but he is a haberdasher and that is a great title on its own). 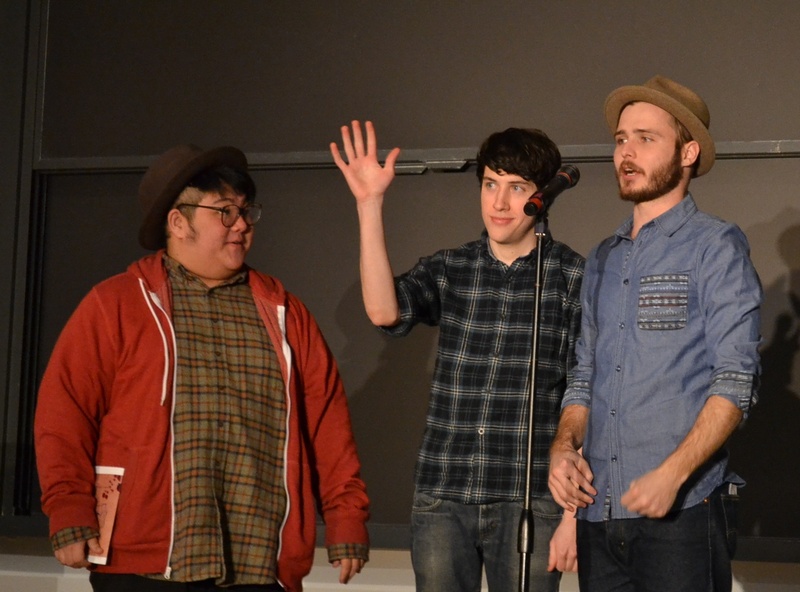 Speak For Yourself — BU’s spoken word poetry collective — welcomed Neil Hilborn, Hieu Nguyen, and Dylan Garity of The Good News Poetry Tour to room 206 of the Photonics building Friday evening. The event started with an open mic where BU students performed their best pieces: on love, vulnerability, individualism, family, and more. The student poems elicited laughs from the audience as well as snaps and gasps. After a poem by Jay Schwartz (COM/CAS ’14), co-president of Speak For Yourself, a loud “I agree!” was shouted from a member of the audience. After the open mic segment, visiting poet Hilborn rushed onto the stage and began the feature performance for the evening (let it be noted that one BU Quad staff writer could not stop raving to her friends about his first poem, “OCD“). The three featured poets took turns reciting original poems for the rest of the evening. One poem was a collaborative performance between Nguyen and Hilborn, and for a handful of the other poems Garity played background piano to his partners’ words. In an impressive display of dexterity, Garity also recited one of his poems while playing piano. Approving snaps and hypnotized silences took over the audience in turns throughout the feature. Speak For Yourself organizes open mic events and poetry workshops — often with features such as The Good News Poetry Tour — and announces them on their Facebook, Twitter, and WordPress pages. For The Good News Poetry Tour’s Northeast tour dates, click here. Cecilia Weddell (CAS 2015) studies Comparative Literature and Mathematics. She likes poetry, basketball, YouTube videos of baby animals, and tea.